NaturaLED utilizes robuts LED technology to provide world-class environmentally responsible LED lamps for general, commercial, and outdoor lighting applications. Their LED technology enables them to offer products that are reliable and eco-friendly, with longer life hours and significant energy savings over equivalent light bulbs. They offer a wide range of DLC certified fixtures, as well as indoor recessed bays and downlights. 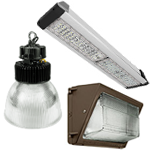 All of their fixtures and wallpacks are LED-based, with many being ENERGY STAR or Dark Night Sky certified. Whether you’re lighting a city street, an office, or a room in your house, NaturaLED has a fixture to suit your application.